Daniel offers a FREE first / introductory lesson! 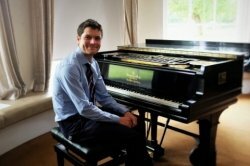 Daniel is a highly experienced pianist, piano teacher and founder of his own piano tuition business, Cadenza Music Tuition, that operates in Cardiff and SW London. He studied at the Royal Welsh College of Music and Drama and graduated with Bachelors and Masters degrees in 2013. His teaching career began in 2011 where he taken on his first private pupils and taught in various settings with the Junior Conservatoire at RWCMD. During this time he studied with internationally acclaimed musicians and educators and maintains some professional and personal connections to the college. Today Daniel teaches one to one and group lessons from his home studio in Cardiff in addition to the ongoing management of Cadenza Music Tuition. He also continues to develop his book series 'Missing Bars' that is exclusively used for his teaching school. From first lessons to diploma, all abilities are covered. All ages are also catered for from 3.5yo to adult. Jazz, Classical and Popular Music are offered with cross disciplinary learning encouraged. Daniel has been teaching since 2011. He is now running his music school from a teaching studio in Cardiff offering one-to-one lessons and group classes whilst managing a team of tutors in SW London. He is highly experienced and always looking to further his own teaching style and manner to ensure the latest resources and pedagogical techniques are being used. Supplementing the teaching are dedicated resources including a branded Practice Notebook, online resources from the Pupil's Portal, and Cadenza Music's own book series called Missing Bars which focuses on aspects of composition and improvisation. DanielFrom Anna (5/5): Always replies prompt. Reply from: Daniel: Many thanks for your review! DanielFrom Dainora (5/5): Always helpful with any questions I have, very creative in finding new ways of how to teach rhythms and playing techniques. Looking forward to having more lessons with Daniel in order to prepare for LRSM exams! Reply from: Daniel: Many thanks for the review. If its not too much to ask, could you post this review on my **Contact Detail Removed** **E-mail Address Removed**/cadenzamusictuition/reviews? Let me know whenever you want to book further lessons. Would be glad to help out.